The history of this recipe is a bit obscure: it’s understood to come from Texas, and it may have been inspired by an Italian torta; this version is from The Moosewood Restaurant Book of Desserts (Clarkson Potter, 1997; p. 99) — Cook’s Country did a much more fattening version (and that’s saying something) which was featured in season 7 of the eponymous TV show. The basic flavors here are coconut and pecan, with a sweet cream-cheese frosting. The pecans are, of course, toasted; the recipe calls for one cup (120 g). The other ingredients are two cups of pastry flour (240 g), 1¼ tsp baking soda, ¼ tsp salt, half a cup (40 g) of unsweetened coconut, two sticks (225 g) of unsalted butter, two cups (400 g) of sugar, four eggs, a teaspoon each of vanilla and coconut extracts, and a cup (240 ml) of buttermilk. These are assembled by the standard butter-cake method (which I’ve done so many times by now, I didn’t even bother to take pictures of the intermediate steps), giving about 1500 g of raw batter, which is divided equally between two previously prepared 9″ (24 cm) round cake pans. 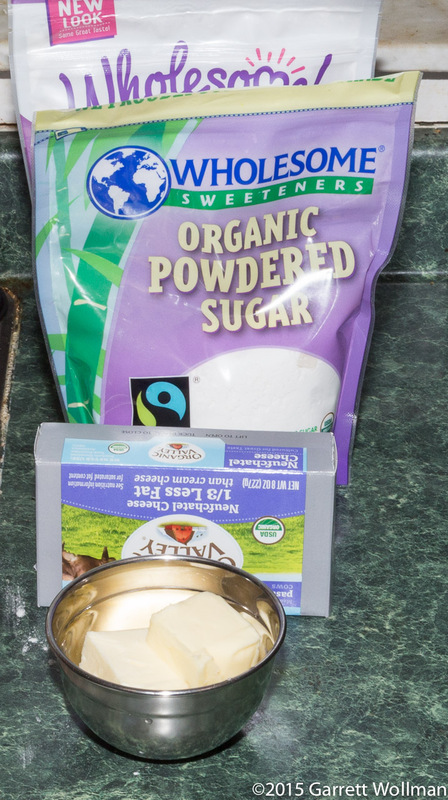 The frosting consists of only four ingredients: confectioner’s sugar (360 g), unsalted butter (2 oz or 56 g), Neufchâtel (6 oz or 170 g), and vanilla extract (1 tsp). The two cake layers were baked in a 350°F (175°C) oven for about half an hour. As you can see, one of the layers appears to be perfectly done, but the other is a little bit on the underdone side. They cool briefly in their pans before being turned out onto the rack to cool completely, about 90 minutes total. And of course the cake that was a little underbaked didn’t depan properly. Luckily, like so many baking sins, this can easily be covered up with frosting in the end. What did I say about covering things up with frosting? 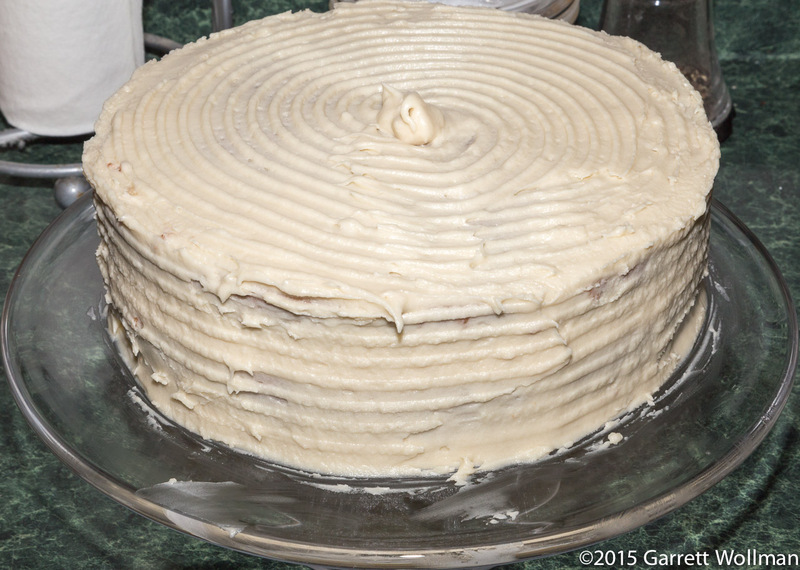 I took about a third of the prepared frosting by weight and used it to fill the cake, placing the torn bottom side of the underbaked layer up so that the voids would be filled by the frosting. 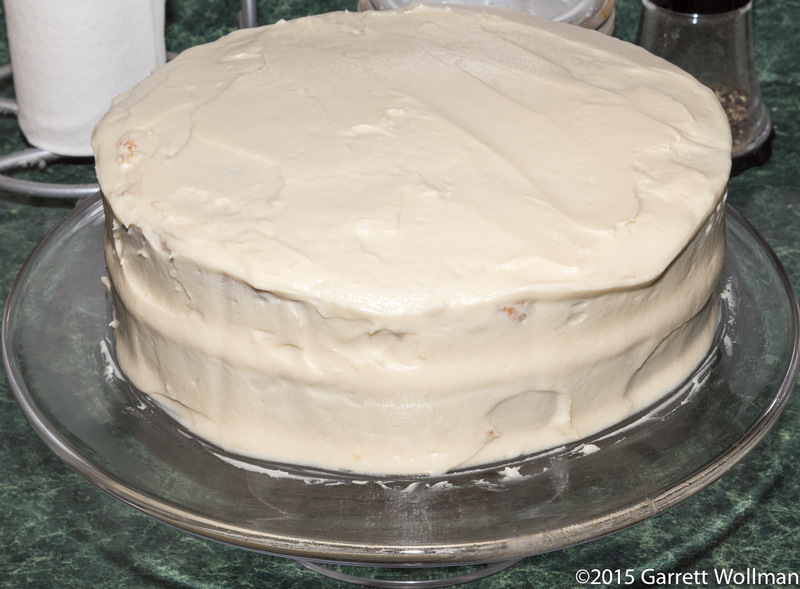 (Everything goes better with cream-cheese frosting, or so it seems.) Doing a separate crumb coat would not have hurt, in all honesty, but the frosting recipe does not make quite enough to do that — and this is supposed to be a simple “kitchen” butter cake, not a fancy bakery item. The frosting is a little soft, however, so it spreads perhaps a bit too easily. After placing top layer (smooth bottom side up!) and dumping the rest of the frosting on top, I spread it all over the cake with an offset spatula. It’s pretty clear that the frosting could have been a bit stiffer. When all else fails, try using a cake comb! Actually, I’m about equally bad with the cake comb as with the spatula, so this didn’t make a whole lot of difference. 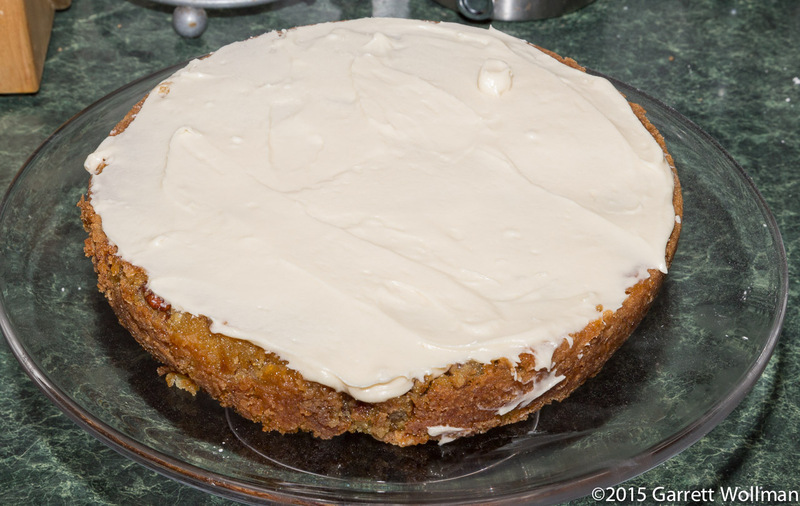 The frosting definitely needed to be a bit stiffer, and it got better after sitting in the refrigerator for a while. (Perhaps I should have made the frosting first, and refrigerated it?) Unfortunately, I don’t have any photos of the interior of the cake — it has a fairly coarse texture, despite the use of pastry flour, probably due to the shredded coconut (this seems to be one of the issues the complications in the Cook’s Country version were trying to address). Over all, this was a very popular cake. Everyone who tried it — even our resident cream-cheese-frosting-hater, professed to like it a lot. The only problem is that even a small piece is incredibly high-cal — and the recipe recommends larger servings. 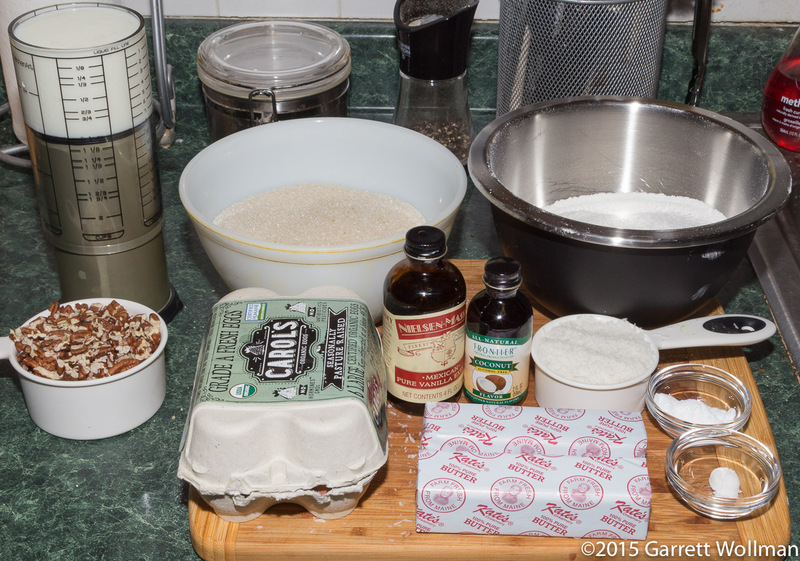 This entry was posted in Food and tagged cake, coconut, Moosewood, pecans, recipe. Bookmark the permalink.